We can definitely applaud Seventeen for promoting body peace as part of the response to SPARK’s own Julia Bluhm’s enormously successful petition asking Seventeen to promote images of real beauty and encourage healthy body image. But unfortunately, Seventeen has just completely undermined the progress they’ve made for girls. On Seventeen’s website, under the same “Health” tab where you can find their “Body Peace Treaty,” is an announcement of their partnership with fat-hating, unhealthy, and downright abusive NBC “reality” TV show The Biggest Loser. They’ve introduced this partnership because The Biggest Loser is, for the first time, featuring three teenage contestants who will appear on the show, but not compete for the prize. Seventeen claims they’re excited to be partnering with The Biggest Loser because it helps people “reach their fitness goals in healthy, realistic ways.” I don’t know what show they’re watching, but The Biggest Loser is the exact opposite of “healthy and realistic.” In this season’s premiere, the first person to go home was eliminated from the competition because he lost the smallest amount of weight lost—15 pounds in a single week. It’s important to note that healthy weight loss is no more than one to two pounds a week, and yet on the show fifteen pounds is too little. In just this one episode, contestants are encouraged, even forced, to exercise until they throw up and pass out—and although the teenaged contestants are exempt from the training sessions where this happens, they’re still being exposed to the attitude that that’s an acceptable way to try and lose weight. One of this season’s contestants is being criticized and mocked all over the internet because she quit the show—and why did she quit? Because she has a history of bulimia, and she couldn’t stand being humiliated and screamed at. 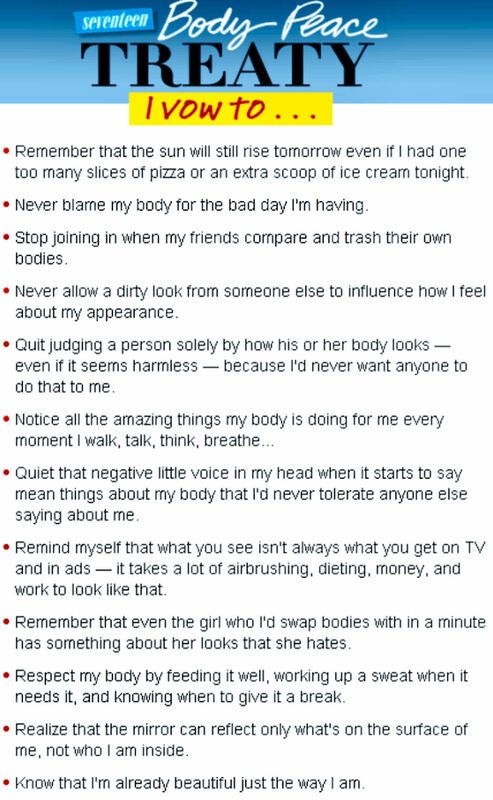 The way fat people with eating disorders are treated is something I’ve written about before. Seventeen itself has addressed the “serious and complex” problem of eating disorders many times, and even acknowledged that the pressure to meet impossible standards of weight is a “big contributing factor”. Now they’re supporting a show that demands impossible weight loss, mistreats contestants with eating disorders to the point that they have to quit the show, and has led to former contestants developing eating disorders. The way contestants are encouraged to lose weight on the show isn’t healthy at all. It’s too fast to be safe. It relies on negative physical effects like fainting and vomiting for shock value. It encourages body hate and makes contestants hate their bodies. Nor is it realistic. It’s only possible in the artificial environment of reality TV. Full-time trainers and nutritionists are helping the contestants, unlike the girls who may read Seventeen’s collaboration with them. Contestants have nothing to do but lose weight, unlike busy teens in the real world. Seventeen can claim “Body Peace,” but it’s nothing but hypocrisy as long as they’re supporting an all-out war against obesity, a war where safety, happiness, and self-acceptance are necessary casualties. Got feelings about Seventeen’s partnership with The Biggest Loser? Sound off below, and let them know what you think by tweeting them @seventeenmag or writing on their Facebook page. The Biggest Loser is a show that shouldn’t even be aired, much less supported by people who encourage a healthy life-style and body-peace. I understand that the methods of biggest looser are a bit extreme but I am a runner. I am a triathlete and an ironman! There have been many races and workouts in my time where I have pushed so hard, I have thrown up. This happens when you push your body to a place that it is unfamiliar. I have no regrets from any time this has happened…I accomplished things that I didn’t know I could. I love what Seventeen has done with this Body Treaty. I love what the Biggest Loser stands for…getting healthy. I love that they have addressed child hood obesity. Let’s love the little steps that they are taking and quit trying to take away from their end goal. The goal is health…not abuse. And when you are healthy you are happy. So let’s all just shoot for that. I’m sorry, Jess, but that is just plain wrong! It’s one thing to push yourself to a new level WILLINGLY, but the contestants on The Biggest Loser are being abused to that level. Plus, it’s not really that healthy to push your body that hard even on your own. You could do some real damage to yourself if you buy into the “no pain, no gain” mantra. And as was said above, what version of The Biggest Loser are you watching? Being bullied, screamed at, pushed till you faint or vomit or injure yourself to lose an unrealistic, unhealthy amount of weight in a short time is NOT healthy nor is it addressing “childhood obesity” in a healthy way. Their goal is NOT health, it’s ratings, that’s all it is. If The Biggest Loser cared about health, they wouldn’t abuse the contestants. Unless, by health, you mean unrealistically thin. I don’t think there’s any abuse, it’s just a form of tough love. Someone like me who wouldn’t thrive in that environment literally wouldn’t take part in the programme but if you do, then why not? In a similar programme here in the UK we’ve seen people throw their toys out of their prams and get angry but sometimes it can make you a lot more motivated. OK sure, it wouldn’t work for me but then I wouldn’t enter an application for the show. At least with the programme, they show you how it is. People don’t put themselves in that position if they don’t want to be there. Unfortunately the lady that pulled out should perhaps have been checked by a psyche team beforehand since she didn’t like being shouted at due to other issues. I’m the same. Shout and me and I’d crumble in a heap, but gently encourage me and I do well. I for one wouldn’t apply to the programme full stop as it would do me no good.